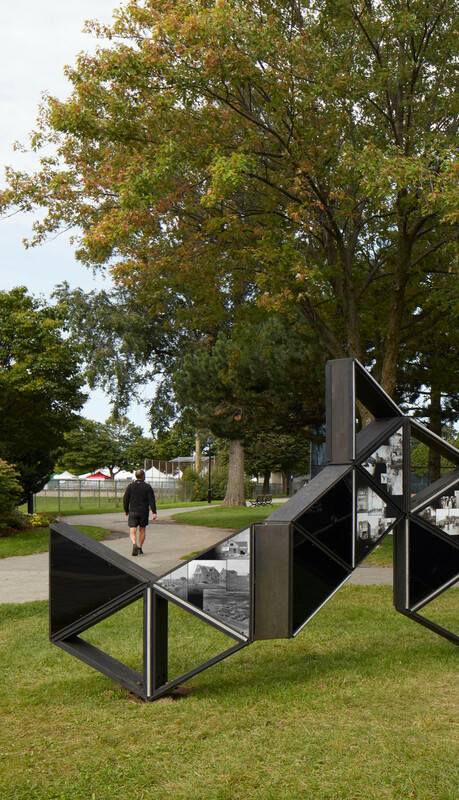 Built over the past four years, this award-winning body of architectural and artistic installations is one of the aspects of Architecturama’s approach. It allowed them to experiment in an empirical, concrete and immediate way with ideas and reflections on architectural design, in particular the processes of perception, both physical, by the senses, and cognitive, linked to the experiences, knowledge, beliefs, etc. specific to each one. These ephemeral projects authorize a freedom and instantaneity impossible in conventional construction. 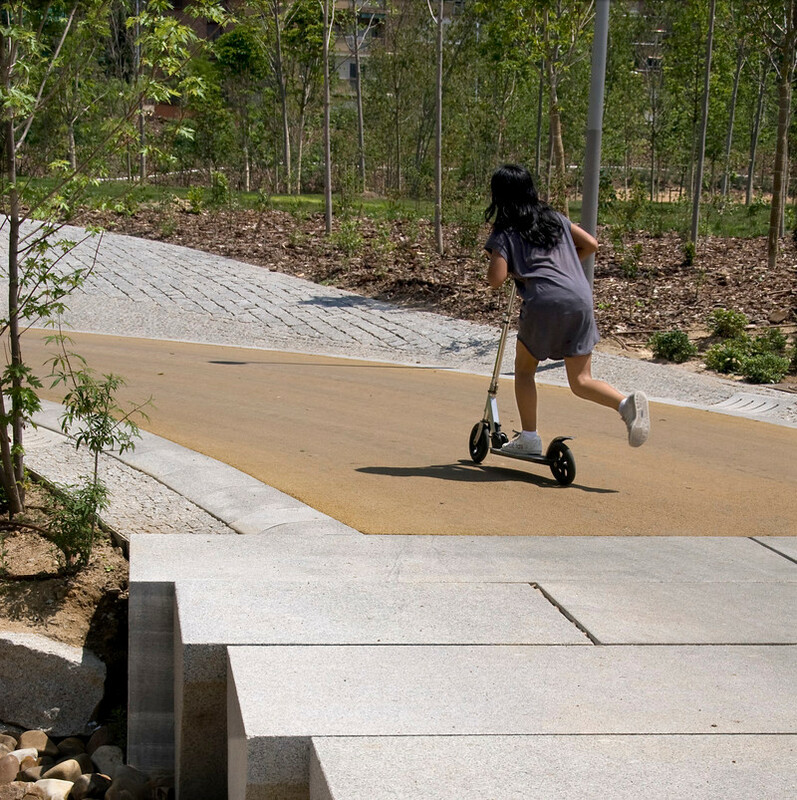 Several of them were carried out by multidisciplinary teams, allowing the architects to work alongside different methodologies and visions of creation. 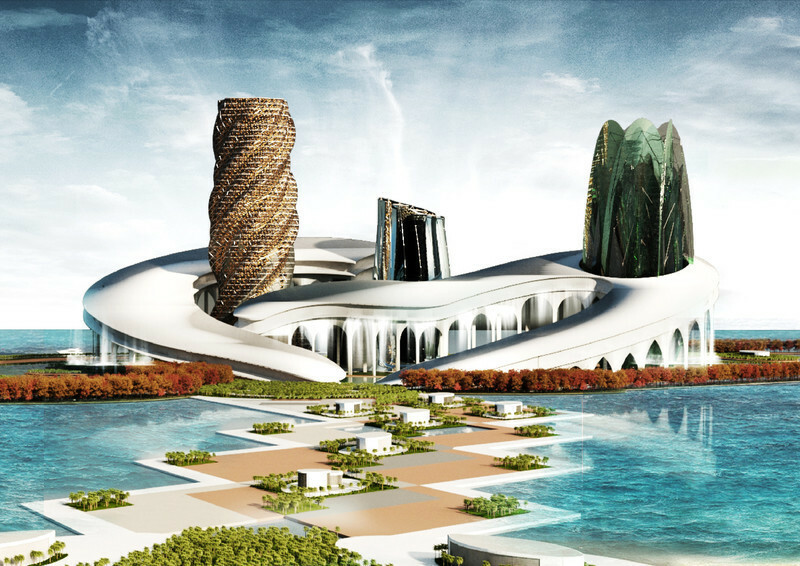 and Loopdrop, on the other hand, are centred on a multi-sensory and unusual experience proposed to the visitors. 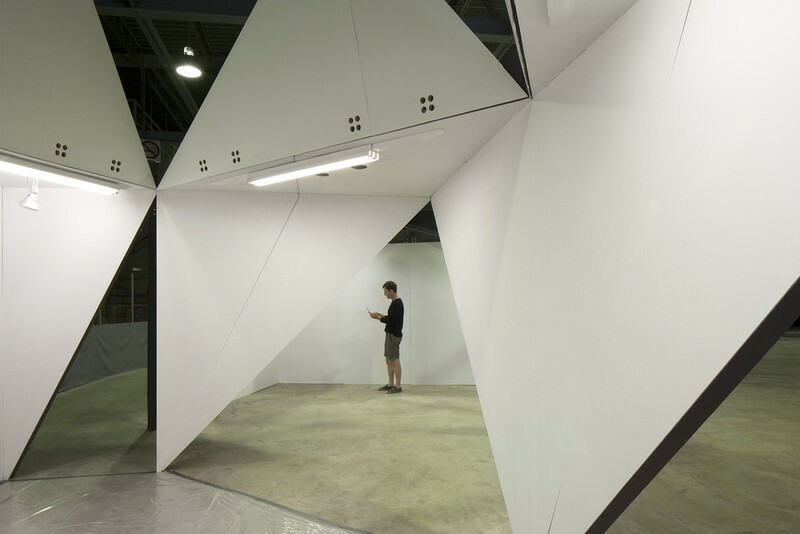 Some of these constructions use unusual shapes and materials for their sensory and/or evocative potential, for example Loopdrop’s soft foam material, FunambOule’s openwork fibreglass flooring or paper as a construction material for Paper 15 and 17 fairs. 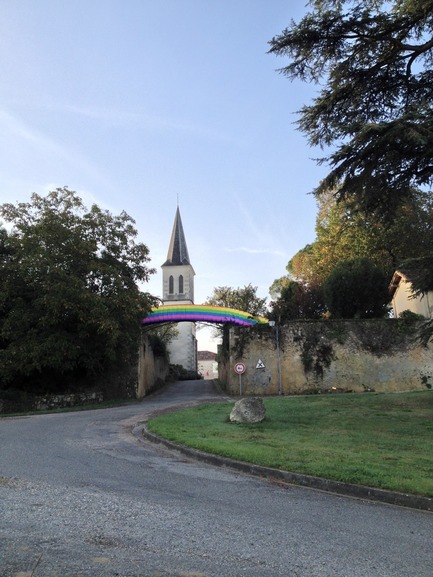 It is the cognitive dimension of perception that is questioned in Five Rainbows over Roques, an architectural research residency in France inspired by the perception of context and its influence on architecture and creation in general. 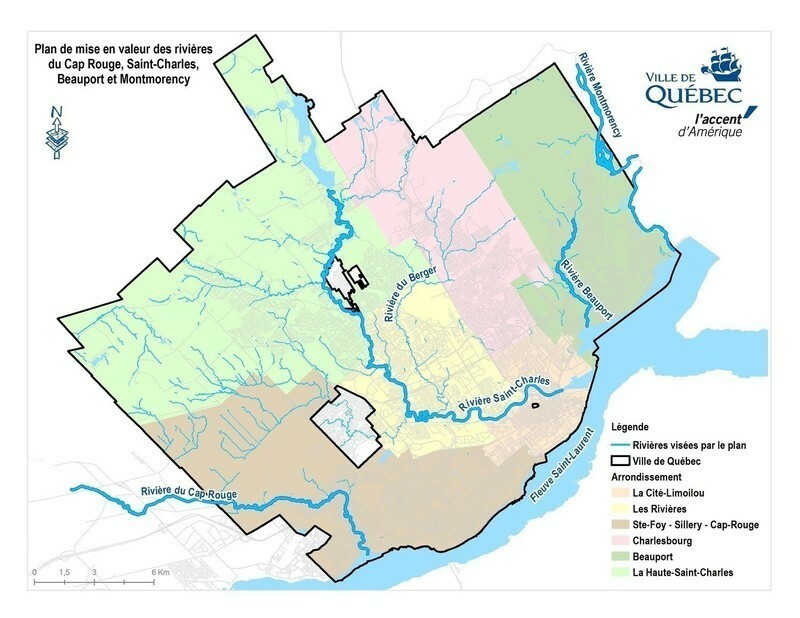 This aspect is also fundamental in the Mise en ondes, Laps and Haie projects, where the history of places and their meaning influence perception and understanding of the physical environment. 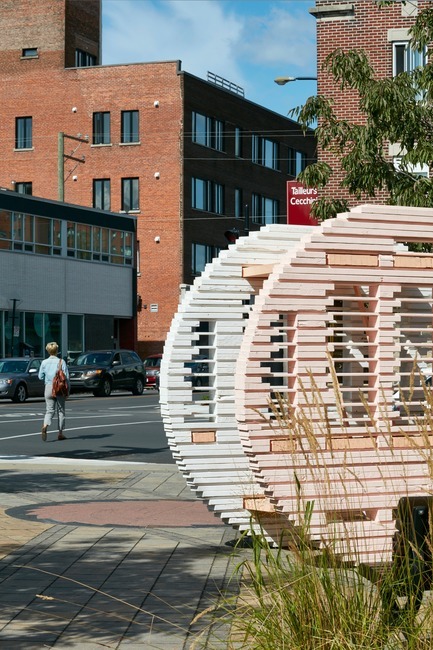 Thanks to its modular, demountable and reconfigurable structure, Laps travelled during the summer and fall of 2017 in the parks and public spaces of the Rosemont — La Petite-Patrie borough, adopting different forms depending on the context. Created from ancient personal photographs and interviews with elders, Laps is a complex device whose intention is to evoke the process of memory and the buried memories that can sometimes resurface. With the participation of older residents, it is a unique story of the neighborhood that is told and preserved. The main inspiration for the shaping of the work lies somewhere between the functioning of the brain (flows between synapses) and that of a computer server. Linear luminous movements circulate periodically on the edges of the structure, connecting the thematic sections of the work, which are illuminated in turn, and triggering sound recordings. Its main material is ash wood from trees in the borough that have been cut down as a result of ash borer. 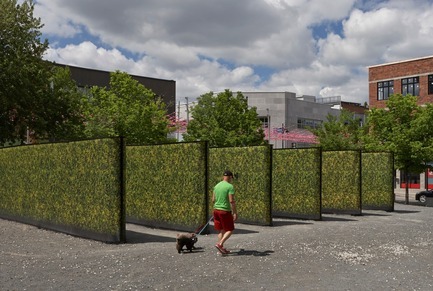 Conceived specifically for the mythical studio of architect and engineer Ernest Cormier, pioneer of modernity in Quebec, it was presented there for two days in the summer of 2017. 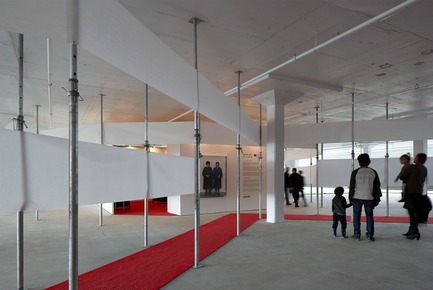 The public, without having seen the space before, is invited to walk through the rooms in a tunnel immersed in darkness. The majority of visitors have some prior indirect knowledge of the building, which is renowned but which few people have visited, which has an influence on perception. A programmed choreography of familiar sounds and air movements combines in space different positions and levels of intensity, from inaudible to saturation. Emitted by common objects, domestic fans, it allows an acoustic reading of the architecture of the building. 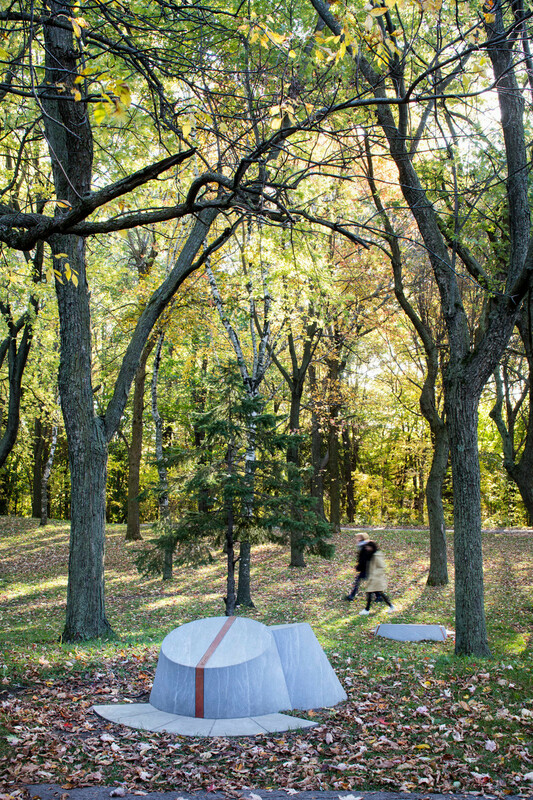 These noises and movements both inform the body of the physical characteristics of space and evoke uses, activities, encounters, both now and as a reference to the rich history of the place. At the exit of the tunnel, the studio can be perceived with all senses in contrast and comparison. 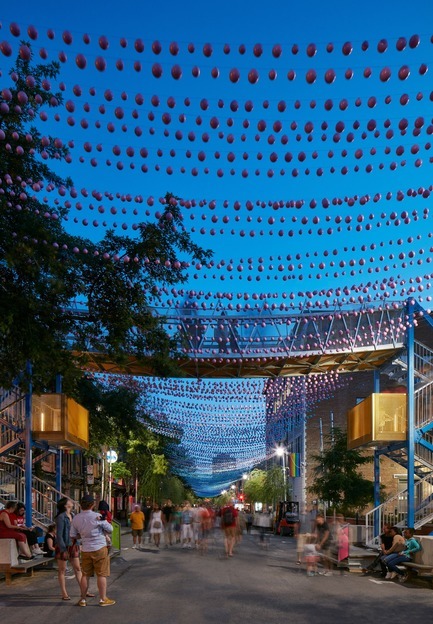 Created as part of the “Aires Libres” festival, the main objective of the project was to offer a new point of view on Claude Cormier’s iconic suspended balls. Visitors, six metres above St. Catherine Street, float on a multi-coloured river of plastic balls. Some people may even experience the “suspended bridge effect” and fall in love*. In reference to the modularity of its components and its function, its aesthetics is partly inspired by children’s construction games. 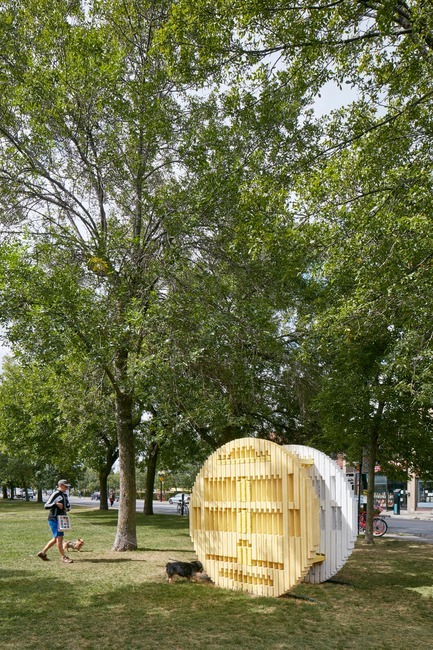 The self-supporting structure is dismantled, stored and then reinstalled each year in a different section of the street. Resulting from an intense collaboration between architect and engineer, the installation recalls the lightweight suspended walkways supported by cables. 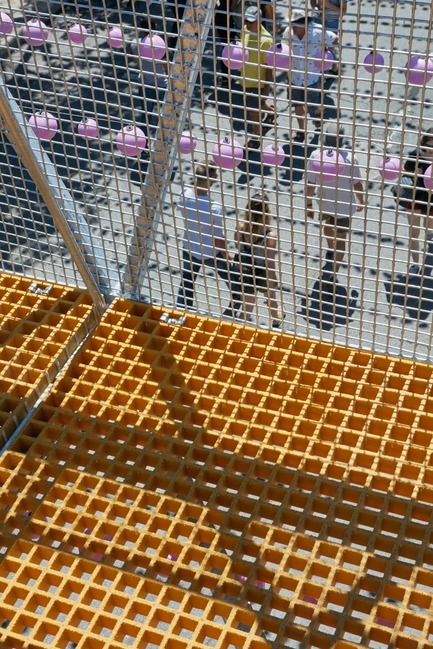 The design of the deck, in curved fiberglass gratings bent according to the profile of the garlands of balls, accentuates the vertigo effect. The railings form three-dimensional trusses that the handrails, designed to be structural, help lighten, being connected punctually to the upper and lower chords. * The suspension bridge effect is a “misattribution of arousal”, in which someone experiences the effects of fear of a physical danger while meeting someone, and mistakenly believes that the other person is the cause of their physical responses (such as elevated heart rate, shortness of breath). 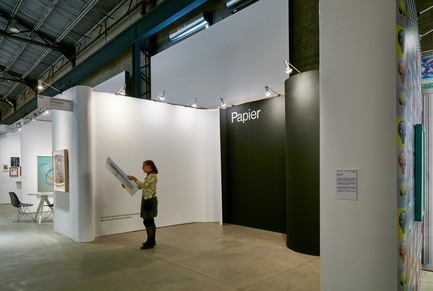 Papier is one of the largest fairs of its kind in North America. 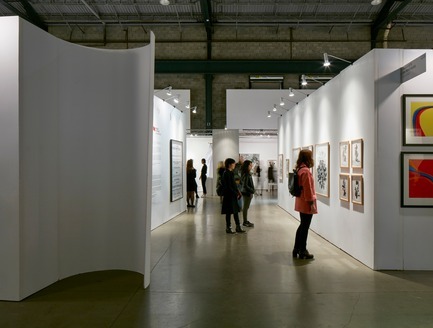 The event is an important driving force for Canadian contemporary art and presents close to 40 galleries and 300 artists each year. Inspired by the physical context of Papier 15, three floors of vast uncluttered industrial spaces, and the theme of the event, paper as a medium, the layout takes advantage of the building while creating the effervescent atmosphere characteristic of this type of fair. 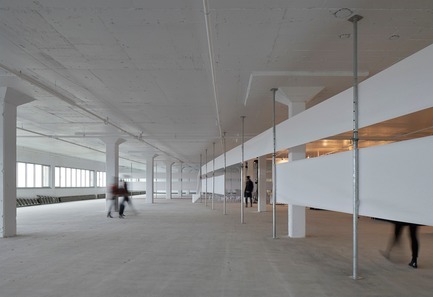 Separations made of paper strips allow the spaces to be subdivided by partial visual closures, while retaining the perception of the extent of the space. The system, which consists of bond paper, adjustable formwork support posts and magnets, also echoes the horizontal window band on all facades. A single circulation loop runs along the perimeter of the floors, keeping the center for services and storage, making orientation simple and fluid. Red carpets lead to vertical circulation in the service core. This scheme also makes it possible to take advantage of the breathtaking views of the city that dialogue with the artworks throughout the visit. The minimal aesthetics chosen for the 2017 edition focuses visitors’ attention on the artworks presented, but also on the architectural treatment of the details of the kiosks and divider panels. 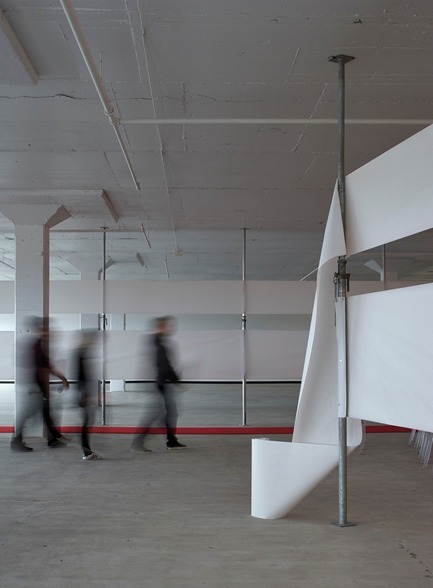 Inspired by the theme of the event, paper as a medium, and the technical and formal properties of this material, the concept transforms the reading of the white surfaces of the layout into sheets of paper that fold and curve to create the spaces. Flexible and fragile, paper becomes relatively strong and structural when bent or folded. The forms are shaped using curves and protuberances constructed with masonite panels and cardboard rolls used for concrete formwork. 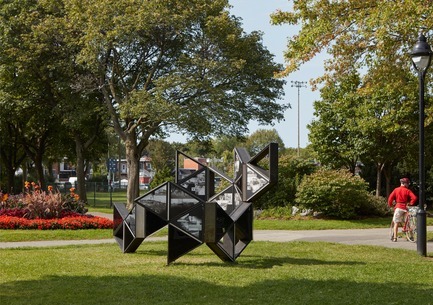 Installed in two parks in the Rosemont — La Petite-Patrie borough during the summer, one in the eastern part and the other in the western part of the borough, they served as anchor points for an artistic event organized by the Regroupement art culture de Rosemont-La Petite-Patrie. As singular objects in the everyday landscape, they are, in addition to their function as a meeting point and support for artistic activity, street furniture and advertising sign displaying information about the event. The painted wooden split circles refer to sunrise and sunset, the selected time of day for the two weekly meetings between an artist and a resident. 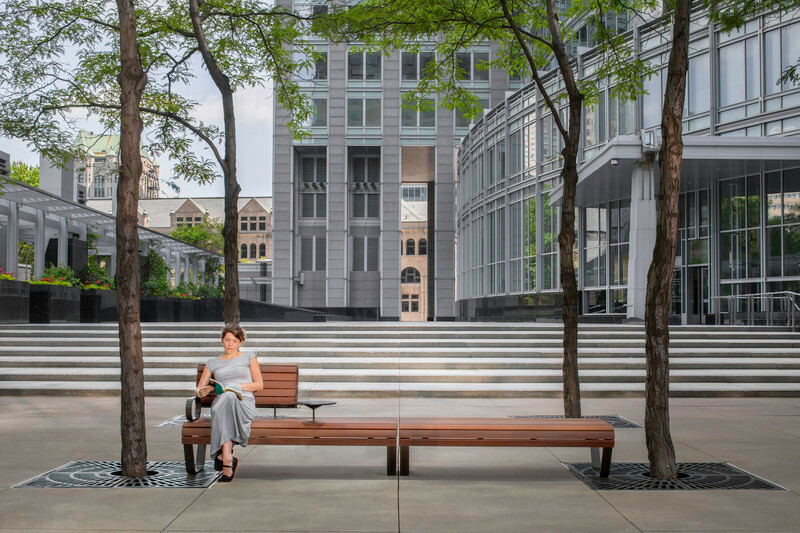 Between their two surfaces, an interstitial space with benches allows for sitting. The motifs create varying degrees of separation from the public space and play with the particular light of dawn and sunset. Using only rough timber and a simple assembly method, they were built with a minimal budget by a labour reintegration organism. 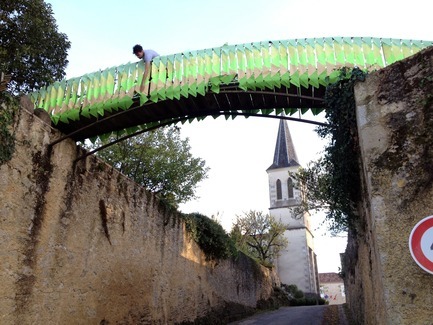 Project conducted as part of a six-week architectural residency in a southeastern French village. 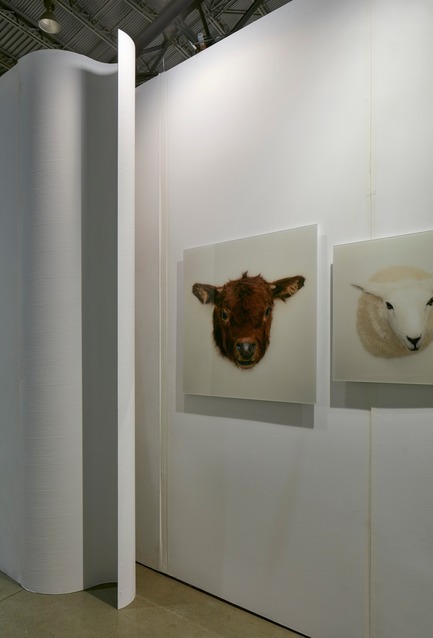 A conference summarizing the experience and an exhibition were presented at the MAQ in February 2015. Based on the idea that every action influences, modifies and constructs the context in which it takes place and that these changes take place on the environment, both tangible and intangible, the first part of the residence consisted of meetings with local architects, artists and designers. They are among the actors whose actions have the most significant impact and their work leads them to reflect, to analyze in a general or specific way the site of their intervention. Some of them deliberately and in various forms integrate issues related to the context but, consciously or not, all of them interact with it. 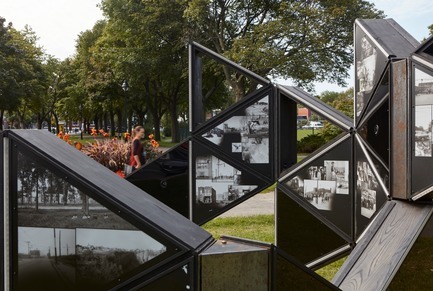 The final phase of the research took the form of five installations that substantially transformed the village’s northern entrance, each day before dawn for a week, so that the artwork could be discovered by residents and visitors in their daily comings and goings. Spatial and visual installation based on perspective and optical illusions and exploring the themes of hedge and labyrinth. 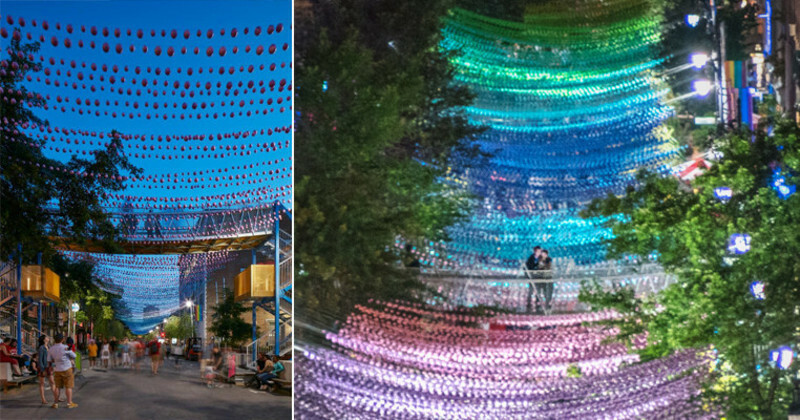 Presented as part of the Aires Libres festival, the installation was made from an existing backlit structure. The history of perspective is one of the searches for an optical illusion. From its beginnings its use extends beyond the flat surfaces and its science is put to good use in the construction of buildings, decorations, gardens, to distort perception and transform reality. A familiar feature of landscape design, the hedge divides, frames and forms space. It is used in particular to separate the public domain from private premises. It also signifies the intellectualization of the landscape and the shaping of the disorder of which the French garden is the ultimate example. The labyrinth has existed for over 4000 years and is present in many cultures. 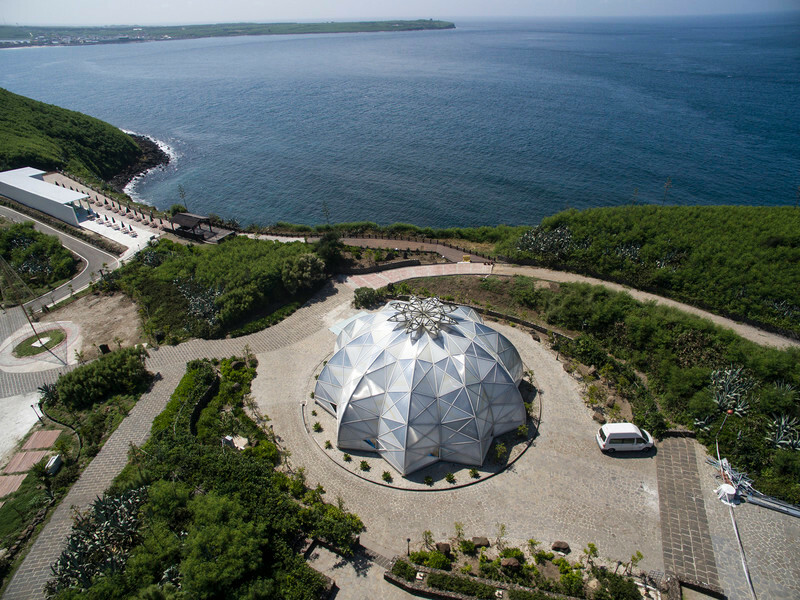 A spiritual and sacred space, it is used for reflection, meditation, reconnection with oneself and the great mystery of creation. An intangible, geometric and abstract figure, it represents the search, the inner quest for an answer or a goal. By extension it symbolizes everything blurred and confused. 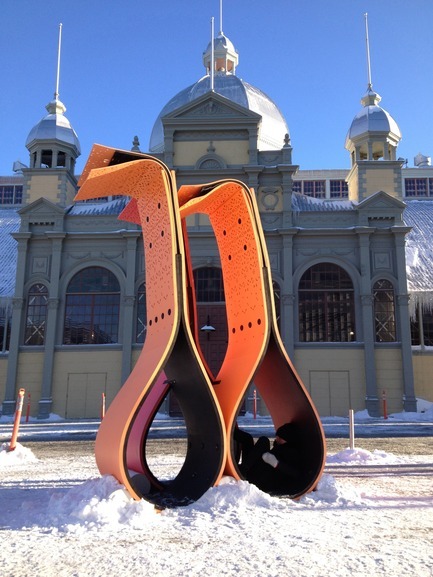 Presented during an outdoor winter event, instead of attempting to block the winter wind, Loopdrop use it as a collaborator that animates the flexible material, causing the upper parts to sway. 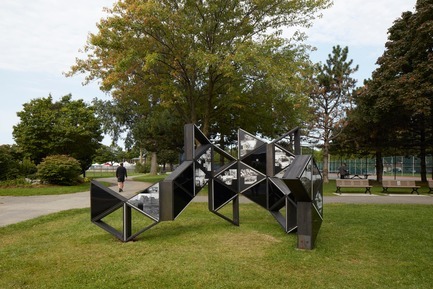 The form yields to the viewer and the weather as well, offering varied resistance and movement depending on the wind force and the actions of the people entering and interacting with the structure. The main material of the project is a semi-rigid high-density foam. The undulations of the assembly cause stresses which in turn increase the rigidity of the structure and its flexibility. To mark the ambiguity of Loopdrop, being a structure posing simultaneously as a sculpture, a piece of furniture, and a play space, its surfaces are marked by the juxtaposition of clashing patterns. Quoting upholstery design and architecture, the patterns are both functional and decorative, serving the structural lightness of the work and letting the light pass through it while revealing the vibrant colours of its materials. Curving and bending foam sheets to form drops allow for the creation of an organic form which playfulness and physical response invites for an array of interpretations, confounding the microscopic and the macroscopic, in a sort of symbolic recall of winter’s role in activating the cycle of life. 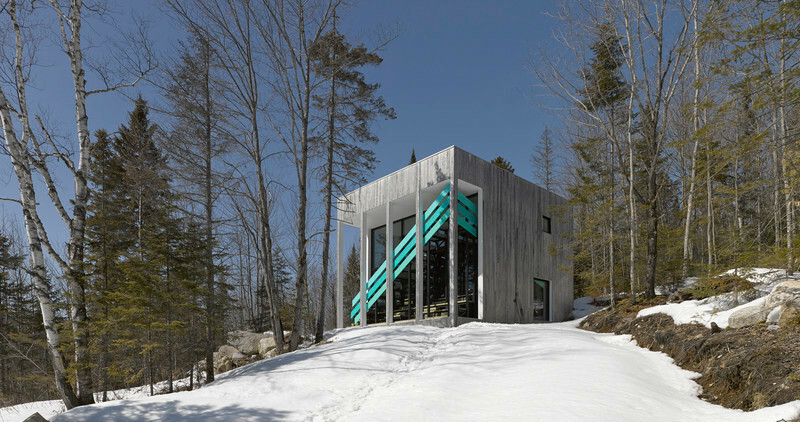 Architecturama is an architectural firm founded in 2012 by Sylvain Bilodeau and Nicolas Mathieu-Tremblay. 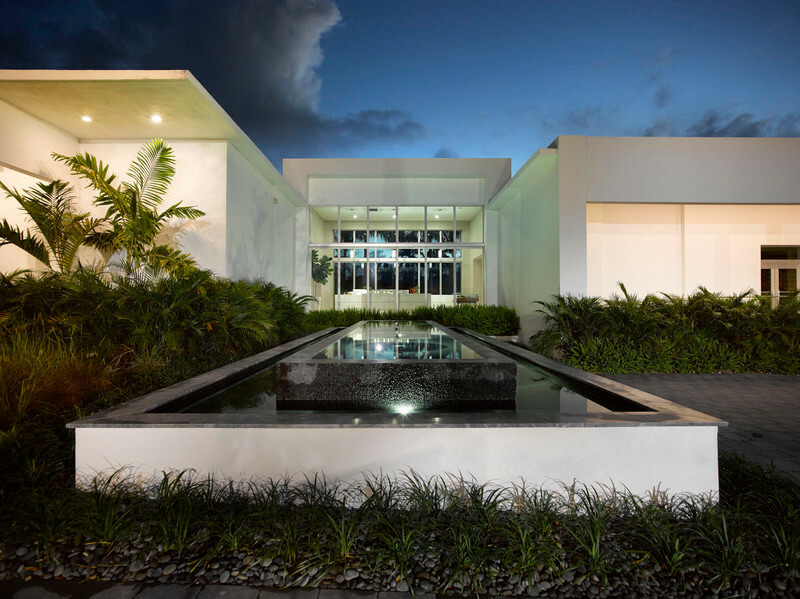 Their original and distinguished practice has recently been recognized with an Award of Merit at the AZ Awards and an award and two honourable mentions at the American Architecture Prize. 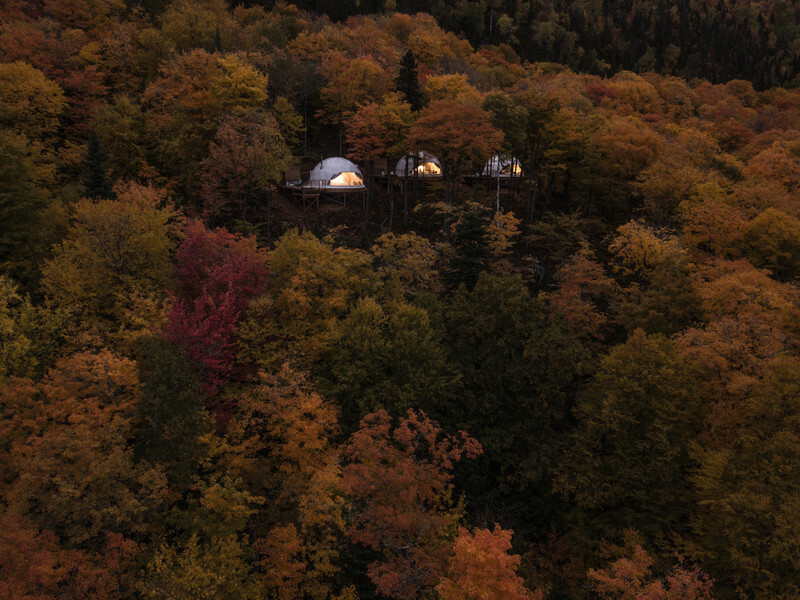 Their Lac Jasper house was a finalist for the Ordre des Architectes du Québec Awards of Excellence and two of their recent projects won awards at the Best of Canada Design Competition. 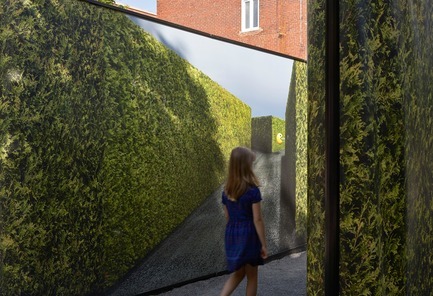 Spatial and visual installation based on perspective and optical illusion and exploring the themes of hedge and labyrinth.